Howdy all. So for a while now I've had this bit of 3/32 O1 in the basement and about a month ago I decided it was time to make it into something. 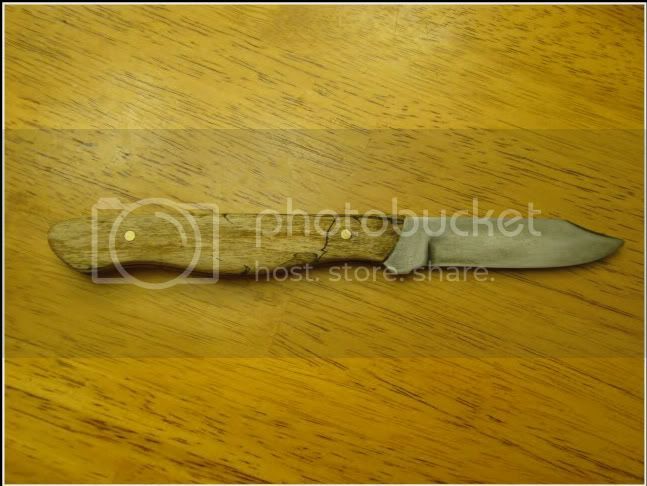 What popped out is the bade pictured in the knife below. Interesting story around it. 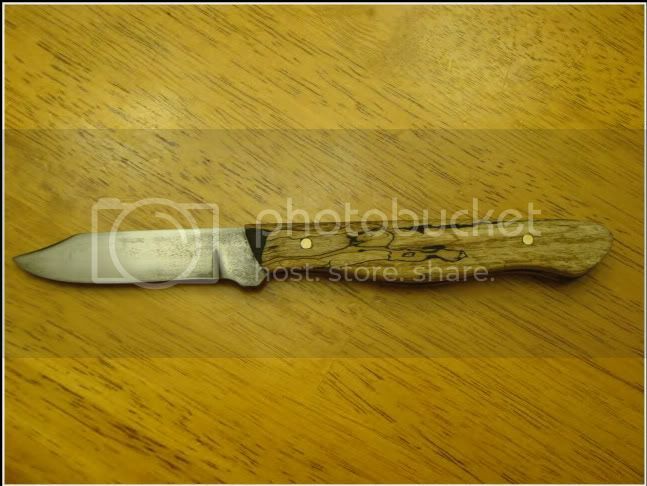 I had showed it to a friend who told me he was looking for just such a knife only he needed it to look... old. Now, even if you know nothing about knife making one thing you probably know for sure, people that make things by hand don't make them to look old. No way. At the same time, dude did offer to buy if I could pull it off. I've posted it in a forum or two and the results are pretty well the same. People either love it, think it's a joke, or don't believe it is brand new. I take that as a good sign. I have had one other inquiry about buying one made just like it though... Go figure. Spend time learning to sand so you can put it chemically... odd old world it is. I got really lucky and found this book in the HPB store here in Columbus. It's a great read. I know this site has taken a definite bent towards the knife thing for two months but I am telling you, if you want a good read, read this book. Readability - 5 of 5 - I really like the way Fowler writes. Editing - 5 of 5 - This is composed of a series of shorter subject matter installments and each is done very well. Subject Matter - 5 of 5 - Everything about knife making and it's all good. Did I like the story - 5 of 5 - In as much as it is a story, yes. Excellent read. 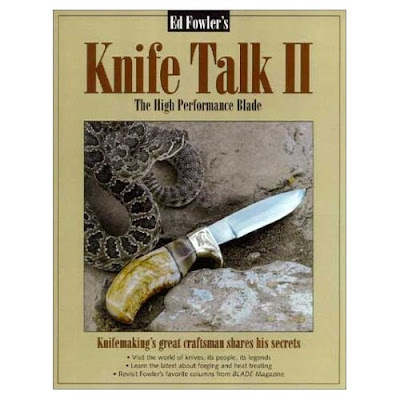 While the previous book was a real how-to sort of thing, this book touches heavily on the philosophy and creative aspects of the knife making craft. It's well done and worth the read for sure. I decided to go digging the scrap pile earlier this week. I had a blade in there that was easily the largest blade I had ever shaped and had truned out to be pure crap once I saw it with the scales loose fit to the sides. It was very much the steak knife thing. I did not like it. I read a thing a while ago that said no knife is every done if it doesn't look right. It may be the way you laid it out but it isn't done if you don't like it. It's just shorter or smaller or shaped a bit different than you thought and you need to keep grinding until you find it. This is one of those projects. Check this one out. It's about 9 inches overall with about 4 inch blade. 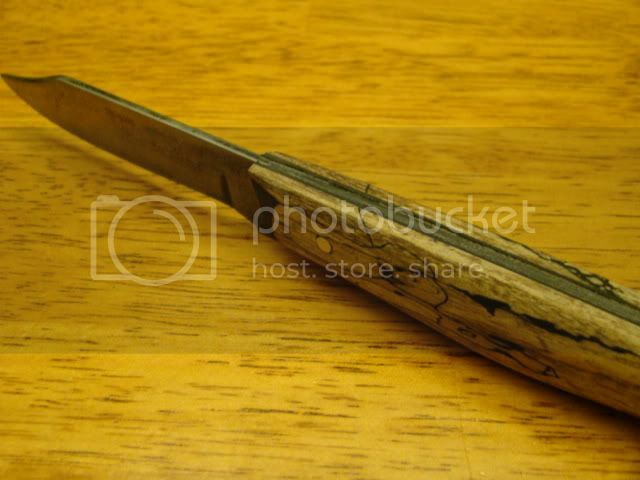 The handle is made from Cocobolo Dymond wood, 4 - 1/8 inch brass pins, a 1/4 inch thong hole, and a 7/32 inch mosaic pin. I ground the shape and the bevel three times looking for the right blade. I think I have it here thought. I am pretty happy with this one.